“Small-business owners who remain convinced they must do everything alone quickly burn out,” says Karen Southall Watts, an entrepreneurship and management consultant. Enlisting help is important, because it gives you the time and space to keep your operation running smoothly — and even grow the business. Watts offers these tips for figuring out which tasks to delegate and how to do so effectively. Start with the sweet spot. Take a moment to write down the tasks that are a perfect match for your core skills, Watts suggests. Chances are this list will line up with your passion and interests (in other words, what made you start the business in the first place). Perhaps you’re great at closing sales, designing products, or marketing to new customers. These are jobs you want to keep doing yourself. Figure out what you can delegate “down.” Write down the tasks you do that don’t require a special skill set (or are so easy that you tend to do them on auto-pilot), such as filing papers, housekeeping, or sending mail and invoices. Consider hiring a secretary, virtual assistant, or other employee to take these over. Or, if you already have staff, consider who’s most appropriate to grab the baton. Figure out what you can delegate “up.”Watts recommends that you also identify the tasks you do that require special knowledge, skills, or a license. Rather than struggle to figure out complex issues alone, you may want to hire an accountant to do your bookkeeping or taxes, a lawyer for contracts and legal work, or a copywriter to take over marketing and publicity. Add to your current skill set. In some cases, it may be better to pay someone to handle short-term tasks which you can take over, at least in part, later on. For instance, if you’re not tech savvy, you might hire a designer to build a professional website for your business. Then, rather than relying on the designer every time you want to make small changes, learn a few basic skills. This is a case where over-delegation may actually be too costly: Perhaps you can take over updating content and maintaining a blog to keep the site fresh. In other words, delegate the heavy lifting, but keep the easy part for yourself. Tell yourself to let go. Perfectionists have a hard time letting go of tasks because they feel no one can do them as well, Watts notes. If you fall into the “if you want something done right, do it yourself” category, focus on the free time you’ll gain by delegating. Provide clear, written instructions to your new helper(s). After a few weeks or months, assess their work. Provide feedback and listen to any input your contractor(s) or employee(s) may have. Chances are, the jobs will get done well without you. Best of all, you’ll be able to concentrate on the tasks you enjoy the most. 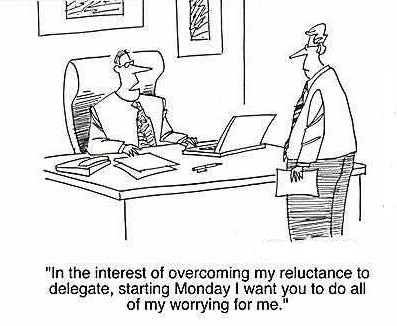 What are your tips for delegating work? Read the full article here.